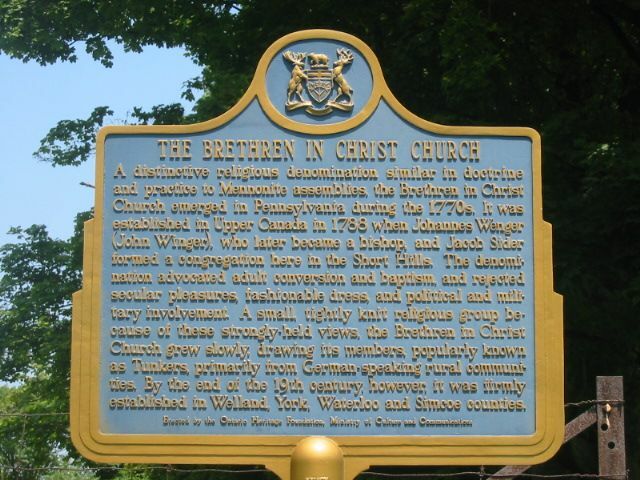 This historical marker in the town of Pellham, Ontario, commemorates the coming of the Brethren in Christ to Canada in the late 1700s. Photo by Alan L. Brown, courtesy of Ontarioplaques.com. 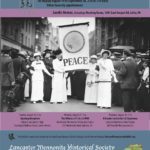 When Jacob Sider and John Wenger packed up their families and left Lancaster County, Pa., in search of affordable land in the Upper Niagara region of Ontario, Canada, they likely had no idea that their economically motivated move would lead to the perpetuation of a rich religious tradition. Nevertheless, Sider and Wenger are credited with helping to establish the Brethren in Christ Church in Canada. Today’s Photo Friday celebrates their work by featuring a plaque commemorating the Brethren in Christ coming to Canada. The plaque resides near the Brethren in Christ Church cemetery in Pelham, near the Short Hills, where the Wengers and Siders are believed to have settled in 1788. A distinctive religious denomination similar in doctrine and practice to Mennonite assemblies, the Brethren in Christ Church emerged in Pennsylvania during the 1770s. It was established in Upper Canada in 1788 when Johannes Wenger (John Winger), who later became a bishop and Jacob Sider formed a congregation here in the Short Hills. The denomination advocated adult conversion and baptism, and rejected secular pleasures, fashionable dress and political and military involvement. 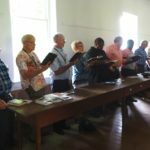 A small, tightly knit religious group because of these strongly-held views, the Brethren in Christ Church grew slowly, drawing its members, popularly known as Tunkers, primarily from German-speaking rural communities. By the end of the 19th century, however, it was firmly established in Welland, York, Waterloo and Simcoe Counties. To learn more about the plaque and Ontario’s commemoration of the Brethren in Christ Church, visit Niagara Green Belt and Ontario Plaques. While a lot of the congregations in the Niagara Area were organized by people coming from the U.S., the Stayner congregation started by my great-great grandmother who was converted all by herself reading her Bible. This was in the 1800’s. She waited nine years for her husband to become a Christian then were baptized together. 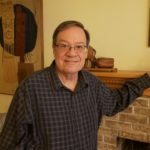 Ministers came from the Markham Township which is north of Toronto, and eventually a congregation was started in the Stayner area. You probably know that already.